Competitive rowing includes many different types of competition, e. g. endurance races, time trials, stake racing, bumps racing and side-by-side formats. There are two types of rowing: In sweep rowing, each rower has one oar, held with both hands. Whereas in sculling each rower has two oars, one in each hand, usually without a coxswain. The standard competition distance for world rowing championship side by side races is 2 km. Our timing system is easy and mobile. The start is effected by a manual push button that releases at the same time a horn signal via the start beep. It is possible to use the start beep for all lanes or arrange several start beeps in the starting area. Our timing controller in the starting area only serves for recording the start time a hundred percent (i.e. as a backup in case the radio transmission is disturbed). The start impulse is transmitted by radio from start to finish. At the finish a manual push button is at hand for each lane. 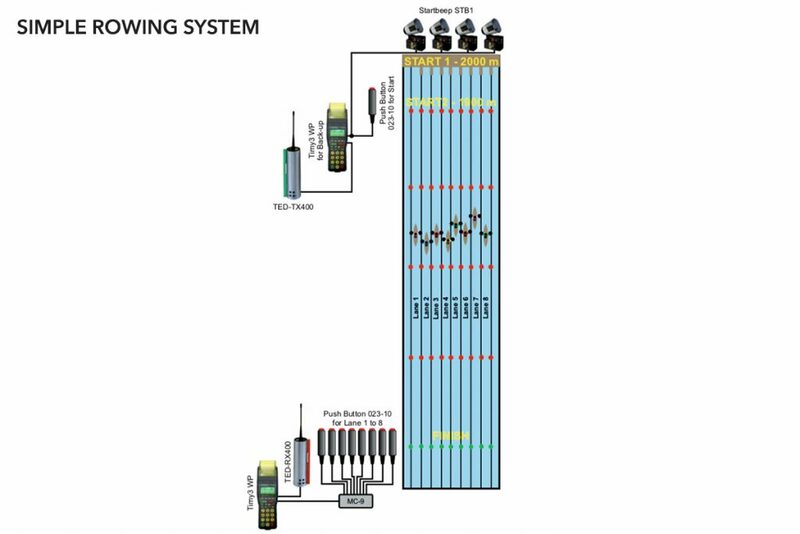 On the timing device up to eight lanes are recorded and printed via eight different timing channels. Of course, it is also possible to connect a display board to the timing device at the finish (shows the running time and/or the winning time). Timing Ireland offers a professional timing system with TimeManager. TimeManager allows to output all channels for each lane with identification (interim time and finishing time). 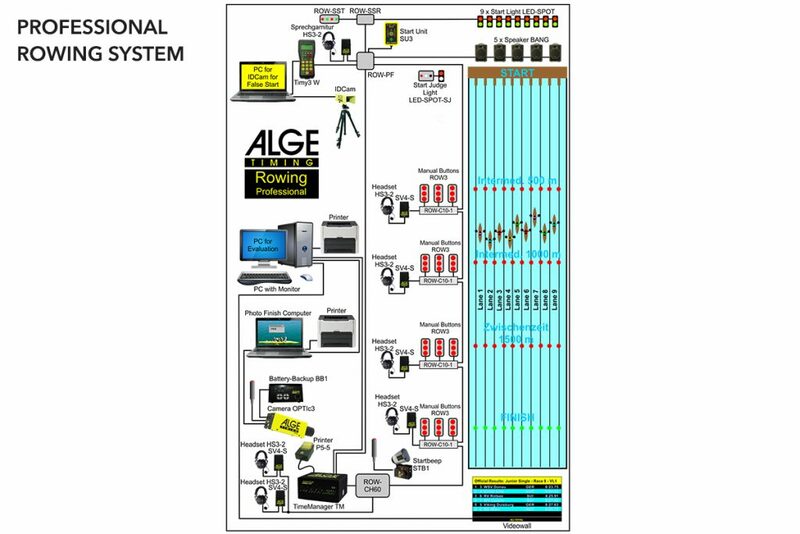 This means for a regatta course with nine lanes there is one start channel, three times nine interim times and nine finishing times, altogether 37 timing channels. Via the Time Manager at the start the starter can announce starting commands as well as the starting signal by speak- ers to the rowers. For each interim time and the finish there are manual push buttons with which each lane can be triggered separately. The finish is recorded and analysed by the photo finish system. The evaluation PC receives all data from the timing device and analyzes it. The complete race rankings are done by the evaluation PC as well as printing of the lists. For communication between start, interim time and timing headsets are at disposal.